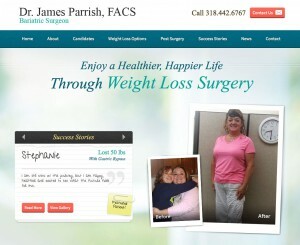 Dr. James Parrish and his entire staff welcome you to our brand new bariatric surgery website! We are pleased to provide you with this exciting new resource as you explore your weight loss surgery options. This blog will function as a key source for learning about bariatric procedures such as the minimally-invasive Lap-Band® surgery, gastric bypass, gastric sleeve, and more. We hope you will utilize our new site to learn more about your bariatric options and check our blog regularly for all the latest news in the bariatric community. If you encounter any questions or would like to schedule a consultation with Dr. Parrish, please contact us. We look forward to being a partner, resource, and guide as you embark on your weight loss journey.